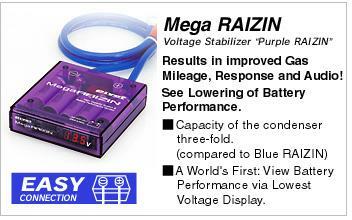 Introducing the top of the line Mega Raizin performance voltage stabilizier with digital voltage display and function. The most high tech performance module you can add to your vehicle! You will increase your vehicles overall performance within 20 minutes or less. Comes complete with ground wire kit, to ground your vehicle properly and improve its electrical system to the chassis. Includes all installation hardware and instructions, made in Japan. Mega Raizin brings you not only ideal electrical efficiency and voltage supply stabilization, but with our original circuitry design and our special noise reduction condenser you can enjoy diminished noise and lessened high-frequency impedance. What are the extra wires for? How does module compare with other performance chips? What is the voltage display for? Noticed right off the bat runs way more smoother. Easy to install. Upon startup, I immediately noticed the starter sounded stronger and the engine fired up quicker. Once I took it on the road, I was amazed. Since my vehicle has electronic assist steering, I noticed the steering was much more responsive. The bass frequencies on my stereo were stronger and even the keyless entry seemed to work better. Didn't really notice a change it the headlights though. Love the LED voltage display. It allows me at a glance to make sure my battery is up to par. Well worth the price and time to install. I was skeptical when i bought this, and i dont know about it actually adding hp but my lights are definitely better and sound system along with it solving my idling issues. If you want performance this is the best thing to get. Their shipping is fast too. Very happy customer!